1. Last night was the best I have slept in weeks! 2. I can’t believe how much the pain has reduced! 3. The Sciatic Nerve Pain has gone down so much! 4. I’m feeling better – do you think it is safe for me to start exercising again? 5. The tingling in my hands has reduced so much – I’m surprised because my doctor told me that I needed surgery – and the physical therapy only made me feel worse. 6. Why doesn’t medical insurance companies send all their back surgery patients in for this instead? It would save the companies so much money and it works so well, is safe, and gentle. 7. I wish my friend tried this before he had back surgery – he can’t even stand up straight anymore and he walks with so much pain. They had to re-do the surgery 3 times and every time he looks worse. He was doing better before he had any surgery! 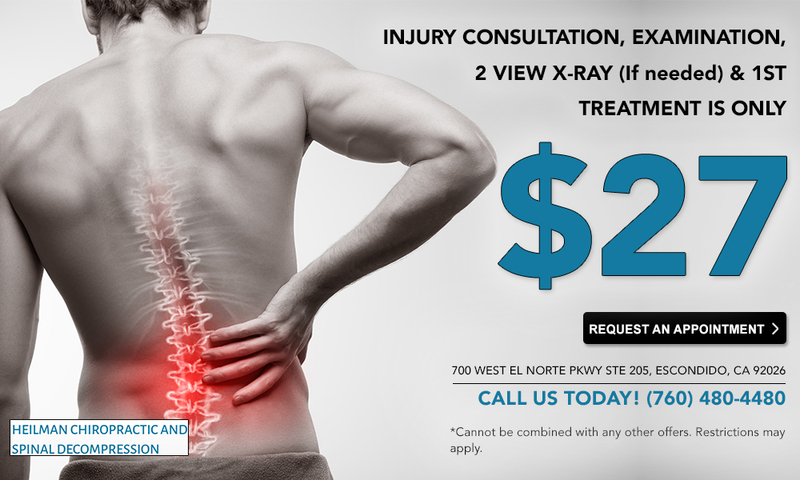 If you or a loved one has been feeling back pain or neck pain and especially if you have pinched nerves – get a FREE – No Obligation Consultation and Examination at our office by calling 760-480-4480. We can even review your MRI results or X-Rays with you if that has already been done.